It is the policy of the IAG to fully comply with the requirements of the UK Data Protection Act 1998 (As amended) and the EU General Data Protection Regulation (GDPR) that comes into force on 25 May 2018. As the IAG is a not-for-profit organisation, we are not required to register with the UK Information Commissioner’s Office. We will collect and store securely only those data needed for the operation of the IAG in support of its members as set out in our mission and aims and objectives. We will seek the permission of each individual to hold such data. The data will be held securely on our main computer system and appropriate backup devices that are fully protected by appropriate security software. Access to these data is restricted to a very small number of individuals, including the Secretary and Treasurer of the IAG, who are fully aware of the need to comply with appropriate data protection regulations. This document describes how the IAG collects and uses the personal information you provide. It also describes the choices available to you regarding our use of your personal information and how you can access and update this information. 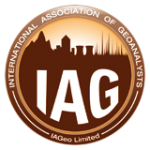 The International Association of Geoanalysts, including its subsidiary IAGeo Limited and the Journal ‘Geostandards and Geoanalytical Research‘, which operates under a publication agreement with the IAG, recognises the importance of (a) protecting the personal information collected from its members and users of its services and (b) taking reasonable steps to maintain the security, integrity and privacy of any information it holds. By submitting your information to the IAG you agree to the practices described in this policy. The IAG may collect personal information from you in the several ways: (1) directly from your verbal or written input, such as information in membership applications, and information provided as part of IAG’s activities, including its GeoPT, G-Probe and other proficiency testing schemes; workshops, courses and conferences; sales of reference materials and any other product and (2) indirectly through information provided online via our website contact form and ScholarOne Manuscripts™, which is the online manuscript submission and management system used by ‘Geostandards and Geoanalytical Research‘. Comments, feedback, posts and other content you provide to the IAG, including through IAG websites. Internet Protocol (“IP”) addresses used to connect your computer to the Internet. To access certain content and to make use of additional functionality and features of the IAG’s websites and services, we may ask you to register for an account by completing and submitting a registration form, which may request additional information. If you choose to register and sign in by using a third-party account, such as a Facebook account, the authentication of your login is handled by the third party, and any personal information collected during that third-party login is not covered by this policy. The IAG may receive information about you if you use websites associated with the IAG, such as ScholarOne Manuscripts™. The IAG may use your personal information to comply with any legal obligations, or for legitimate reasons in pursuing the Association’s not-for-profit aims and obligations, including but not limited to one or all of the following: providing direct marketing; modifying our services, products and communications; detecting fraud; investigating suspicious activity and ensuring the security of the IAG’s websites. Personal information will not be kept longer than is necessary for the purpose for which it was collected. This means that, unless information must be retained for legal or archival purposes, personal information will be securely destroyed when it is no longer required or, where applicable, following a request from you to destroy or erase your personal information. We will use appropriate safeguards to protect your data. Access to your personal data will be restricted to only those who need to know that information in order to perform their job function. The officers and associates of the IAG are instructed about the importance of maintaining the confidentiality and security of your information. Identifiable personal information, e.g. your name or e-mail address, that you voluntarily disclose and that is accessible to other users, e.g., on social media, forums, bulletin boards or in chat areas, that may be accessed via IAG websites, could be collected and disclosed by others. The IAG cannot take any responsibility for such collection and disclosure. The IAG will not use your personal information for marketing purposes, nor disclose your information to any third parties, unless we have your prior consent, which we will seek before collecting your personal information. The IAG’s websites or services may include links to third-party websites. In using such links, please be aware that each third-party website is subject to its own privacy and data protection policies and is not covered by this Data Protection Policy. This data protection policy is reviewed periodically, and the IAG reserves the right to modify it at any time without notice. Changes to policy will be posted on this page and will become effective on the date of posting. We encourage you to periodically review this page for the latest information on our data protection practices. Any comments, complaints or questions concerning this policy or complaints or objections about our use of your personal information should be addressed by directing your comments to the IAG’s acting Data Protection Officer, who is the Hon. Secretary of the Association.